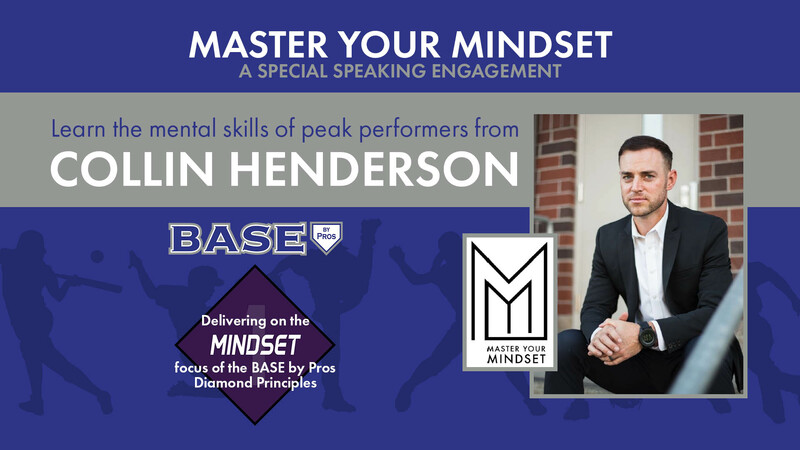 Learn the mental skills of peak performers as we welcome acclaimed speaker Collin Henderson back to our BASE by Pros Training Academy on Sunday, May 19, 2019 from 5 PM – 7 PM. Collin is a former two-sport athlete at Washington State University, where he was a captain, Academic All-American, and Pac-12 Champion. He is an author, speaker, and mental conditioning coach for professional and amateur athletes. Collin’s presentation, “Master your Mindset”, will cover self-talk, visualization, developing winning habits, self-image, growing from failure, and performing under pressure. Success on the field begins with a commitment to grow mentally. Mindset is one of the four Diamond Principles we focus on here at BASE by Pros, so this is a presentation we encourage both players and parents to attend. Tickets are just $20 per family at the door (FREE for BASE by Pros members). Due to limited space, we ask that all attendees please register online to reserve seats. Care to help us spread the word? No Replies to "Collin Henderson Presents "Master Your Mindset" (5/19/19)"
Hey, it's cold outside. Why rake the leaves when you could be raking in the cages? Contact us for batting cage and pitching machine availability and book a spot! Join our e-mail list to hear about events, training tips and more! © Copyright 2015-2019 BASE by Pros. All rights reserved.